For centuries, the countryside of northern Wales has been dotted with farms and stone walls which define property lines and keep sheep from venturing into neighboring pastures. 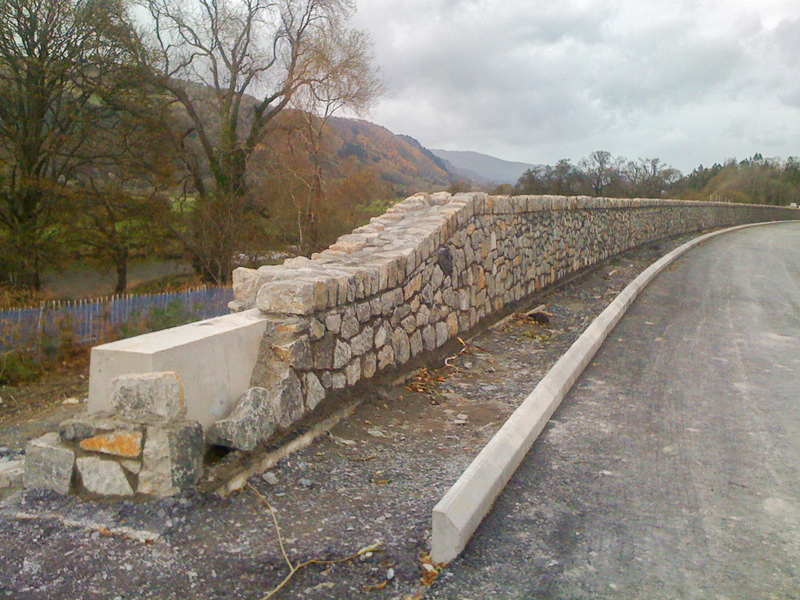 Recently, realignment of the A470 trunk road north of Llanrwst between Penloyn and Tan Lan required a barrier wall to be placed between the new road and the existing Conwy Valley railway line. Engineers at Balfour Beatty had their hands full as the project required not only redirecting the road, but included a walking/bike path, a box culvert for bat migration and a requirement to encase the barrier in stone. In addition to the physical work, contractors faced numerous constraints like flood alleviation measures for the local fishing club, working in close proximity to the existing rail line, and limited lane closures due to heavy traffic on the busy two-lane highway. Roocroft Fencing of Leyland, UK, poured the 1.65m (5′ 5″) high barrier with 9 20mm diameter (#6) rebar with their Power Curber 5700-C-MAX. 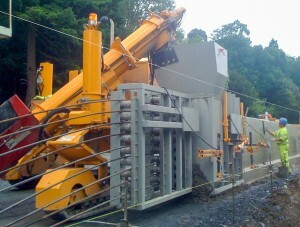 The machine, painted bright yellow to meet UK safety requirements, slip-formed the job with ease. The height of the wall was required to create maximize containment between the road and railway. After completion of the barrier wall, stone masons placed natural stones over the front, back, and top of the wall so that it would match the centuries-old walls throughout the valley. David Roocroft, Commercial Director of Roocroft Fencing, who previously owned a 5700-C before adding the 5700-C-MAX, has been pleased with his latest machine. 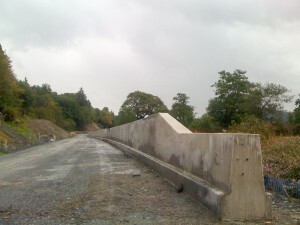 “It has been working great on our large and wide barriers.” Roocroft Fencing entered the slipform market in 2007 and pours curb and barrier across the United Kingdom.